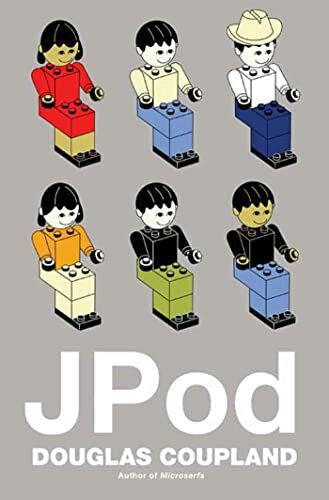 Douglas Coupland's newest novel Jpod is available for pre-order on Amazon. The book is listed to ship on May 16th. Although, advance reading copies have been floating around eBay. Ethan Jarlewski and five co-workers are bureaucratically marooned in JPod, a no-escape architectural limbo on the fringes of a massive Vancouver video game design company. The six JPodders wage daily battle against the demands of a boneheaded marketing staff, who daily torture employees with idiotic changes to already idiotic games. Meanwhile, Ethan's personal life is shaped (or twisted) by phenomena as disparate as Hollywood, marijuana grow-ops, people-smuggling, ballroom dancing, and the rise of China. JPod's universe is amoral and shameless - and dizzyingly fast-paced. The characters are products of their era even as they're creating it. Everybody in Ethan's life inhabits a moral grey zone. Nobody is exempt, not even his seemingly straitlaced parents or Coupland himself. Full of word games, visual jokes, and sideways jabs, this book throws a sharp, pointed lawn dart into the heart of contemporary life. Coupland dispels the rumors: "Since 1992 there have been bizarre and persistent rumors that I collect meteorites, live in Scotland, don't own furniture or art, and live in a house designed by someone named 'Ron Thon.' Huh? The weird thing is, after a decade of being falsely told I collect meteorites, I thought about it and realized, 'that's not actually a bad idea.' So now I really do collect meteorites. But I don't live in Scotland - never did. I own a fair amount of furniture and art (I make the stuff) and the house I live in was designed by Canadian modernist master Ron ThoM. I live in Vancouver, and recommend that others do the same."